Disclosure: I'm excited to share this sponsored app review with all of my readers! All opinions are my own! I'm a very busy Mother, between juggling work, the kids, this blog, etc, I have my hands full, and I love it but it takes a lot to keep things running smoothly. One of those things is my iPhone-- I have several apps that I use daily and I always get excited when I am introduced to a new app like Rise! 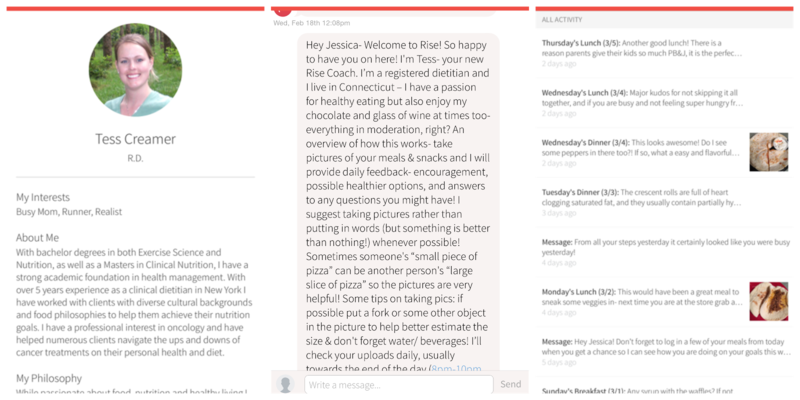 Rise is a mobile app that puts a real, licensed nutritionist in your pocket. There are a lot of traditional nutritionist out there and the costs can quickly add up, but that's not the case with Rise. 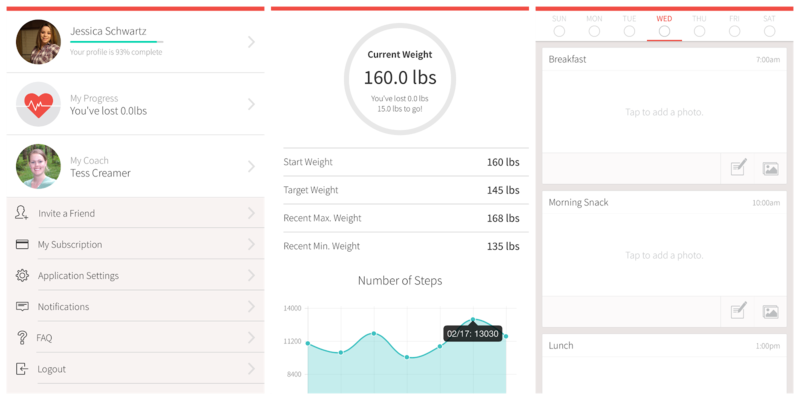 The Rise app pairs you with a registered dietitian. You simply snap photos of your meals and share them with your coach. Every day your coach will provide you with personalized feedback on your meals as well as encouragement on how to reach your goals! I like that Rise makes it easy to lose weight, reach your goals, even gain a new friend! As a parent we all know how challenging it can be to live a healthy, balanced lifestyle. Not only is it important for ourselves, but it's important to set an example for our children as well. I get it first hand, trust me, there are some nights after a really long day that I honestly don't feel like cooking dinner and so I'll give in and order a pizza or pick up fast food. Does that make me a bad parent? No, however after using the Rise app and working with a personal coach, I discovered that I need to add more veggies into my meals, watch my servings and eat healthier. I'm a visual person, and the Rise app isn't like any other app I've ever used. I love that when I use the app I'm holding myself accountable for what I'm putting in my body. No one is making me eat that food, or those portions, etc., and I loved being able to see the good and the bad foods that I was consuming! Getting started with Rise is easy! You can visit them online or download the app on your iPhone, iPad or Android device, then simply fill out the short questionnaire. 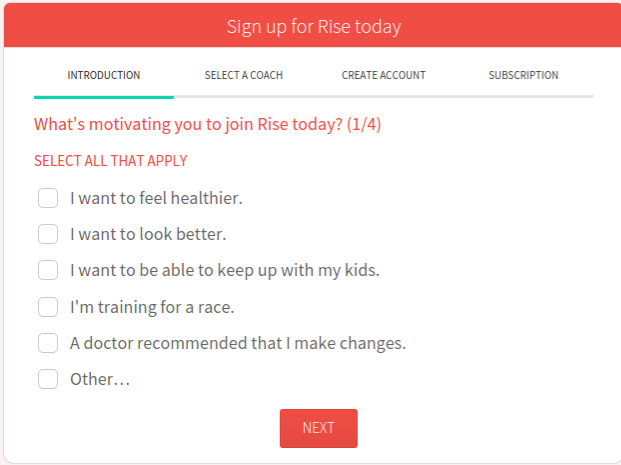 You'll answer simple questions like, "What's your motivation for joining Rise? ", "How ready are you to make changes? ", "What's your eating style?" and more. Next, you will insert your weight, height, goal weight, birthday, pick a coach, create your account and then choose your subscription. Very easy! Once you've downloaded the Rise app onto your mobile device, you will have a few different screens you can navigate through. The Journal is where you will add your daily food and drink logging. You can view a week at a time, and there are sections for breakfast, morning snack, lunch, afternoon snack and dinner. Within each block, you can insert the photo of your meal as well as leave a few notes of your ingredients, what your meal is, etc. The next screen is your Messages. Here you can chat with your personal coach at anytime-- it's a great way to check in, ask questions, seek advice on maybe the portion of a certain meal and more! In the Activity screen you can see notes from your coach, either messages he/she has sent along with notes that your coach might attach to one of your meals. The last screen is your Profile. 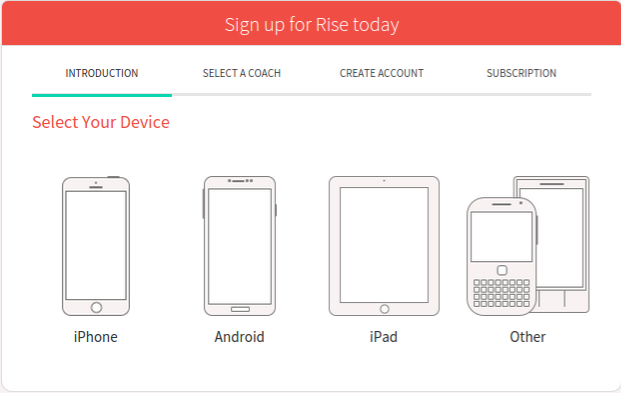 Here you can see your progress, read your coach's profile, manage application settings, even invite a friend who might enjoy using the Rise app! Did I mention you can even sync your FitBit or share your Apple Health with your personal coach? Just one more way to help you reach your goals and stay on top of your daily activities! 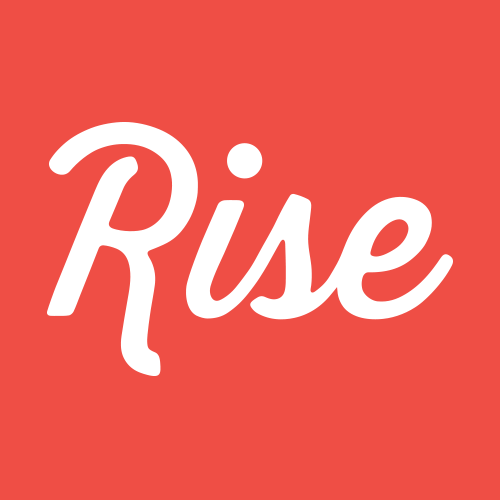 I personally have been enjoying using the Rise app-- it's easy to use, and I love connecting with Tess my coach. She was full of information, always provided great advice and is super nice! Whether your wanting to shed a few pounds, cut some calories out of your daily diet or train for a special event, I encourage you to check out Rise and download the app! So what do you think about Rise? Be sure to stay connected with Rise on Facebook, Twitter & Pinterest!